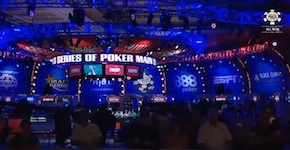 ESPN’s coverage of the 2015 World Series of Poker has been up and running for four weeks now, with eight-and-a-half hours’ worth of shows shown so far. I think that total is correct, anyway, as an extra half-hour turned up this week. They’ve moved the shows around some on the schedule, making it challenging to find them sometimes, although mostly they’ve been popping up on Monday nights. The strategy appears to be mostly to put the episodes on one network while NFL football is playing on the other, which I have to think hasn’t helped a lot with ratings. It also means I’ve actually never watched any of them initially but only later on DVR. I think all of them present genuinely interesting spots that are made a little more fun from a strategic standpoint when you don’t know all the players’ holdings. Watching the shows with an eye toward finding such spots is probably adding significantly to my enjoyment of them, too, I would venture. As those titles suggest, the coverage to this point has featured a lot of Hellmuth (until he busted) and Negreanu, with the latter destined to be front and center all of the way up to the November Nine thanks to his near-miss of the final table. They started with Day 4 this year, and by now they’ve gotten to the end of Day 5 at which point just 69 remain from the 6,420 who entered. Would have been preferable, I think, to start back on Day 1 and give a couple of hours to each of the days (rather than four or more for both Day 4 and 5), but obviously it’s cheaper to shoot fewer days. Starting on Day 4 means they actually began after the bubble burst (on Day 3), which skips one of the more exciting moments of the Main Event. This year, too, with 1,000 players cashing, there were certainly dozens (if not hundreds) of cool stories about first-time players/cashers which might have been entertaining to hear about, along with all of the other fun stuff that tends to mark the early days of the WSOP ME. Still, I’m finding I’ve been looking forward to the shows each week. Have you been watching at all? What do you think? It also means I’ve actually never watched any of them initially but only later on DVR. I've been watching on YouTube. Last year (2014), they also started filming on Day 4, but we weren't in the money until two hours or so into the day (only around 680 cashed, instead of 1,000). I wasn't on TV, but it was fun to see players who were with whom I played. Norman Chad was walking around (Day 4), taking notes and talking to players. I guess he finds it helps him get ready for the telecast.